This article is about the monolithic statues of Easter Island. For other uses, see Moai (disambiguation). Moai /ˈmoʊ.aɪ/ ( listen), or mo‘ai, are monolithic human figures carved by the Rapa Nui people on Easter Island in eastern Polynesia between the years 1250 and 1500. Nearly half are still at Rano Raraku, the main moai quarry, but hundreds were transported from there and set on stone platforms called ahu around the island's perimeter. Almost all moai have overly large heads three-eighths the size of the whole statue. The moai are chiefly the living faces (aringa ora) of deified ancestors (aringa ora ata tepuna). The statues still gazed inland across their clan lands when Europeans first visited the island in 1722, but all of them had fallen by the latter part of the 19th century. The production and transportation of the more than 900 statues are considered remarkable creative and physical feats. The tallest moai erected, called Paro, was almost 10 metres (33 ft) high and weighed 82 tonnes (90.4 short tons). The heaviest moai erected was a shorter but squatter moai at Ahu Tongariki, weighing 86 tonnes. One unfinished sculpture, if completed, would have been approximately 21 m (69 ft) tall, with a weight of about 145-165 tons (160-182 metric tons). The moai were toppled in the late 18th and early 19th centuries, possibly as a result of European contact or internecine tribal wars. The moai are monolithic statues, their minimalist style related to forms found throughout Polynesia. Moai are carved in relatively flat planes, the faces bearing proud but enigmatic expressions. The human figures would be outlined in the rock wall first, then chipped away until only the image was left. The over-large heads (a three-to-five ratio between the head and the trunk, a sculptural trait that demonstrates the Polynesian belief in the sanctity of the chiefly head) have heavy brows and elongated noses with a distinctive fish-hook-shaped curl of the nostrils. The lips protrude in a thin pout. Like the nose, the ears are elongated and oblong in form. The jaw lines stand out against the truncated neck. The torsos are heavy, and, sometimes, the clavicles are subtly outlined in stone. The arms are carved in bas relief and rest against the body in various positions, hands and long slender fingers resting along the crests of the hips, meeting at the hami (loincloth), with the thumbs sometimes pointing towards the navel. Generally, the anatomical features of the backs are not detailed, but sometimes bear a ring and girdle motif on the buttocks and lower back. Except for one kneeling moai, the statues do not have clearly visible legs. Though moai are whole-body statues, they are often referred to as "Easter Island heads" in some popular literature. This is partly because of the disproportionate size of most moai heads, and partly because many of the iconic images for the island showing upright moai are the statues on the slopes of Rano Raraku, many of which are buried to their shoulders. Some of the "heads" at Rano Raraku have been excavated and their bodies seen, and observed to have markings that had been protected from erosion by their burial. The average height of the moai is about 4 m (13 ft), with the average width at the base around 1.6 m (5.2 ft). These massive creations usually weigh around 12.5 tonnes (13.8 tons) each. All but 53 of the more than 900 moai known to date were carved from tuff (a compressed volcanic ash) from Rano Raraku, where 394 moai in varying states of completion are still visible today. There are also 13 moai carved from basalt, 22 from trachyte and 17 from fragile red scoria. At the end of carving, the builders would rub the statue with pumice. Easter Island statues are known for their large, broad noses and strong chins, along with rectangle-shaped ears and deep eye slits. Their bodies are normally squatting, with their arms resting in different positions and are without legs. The majority of the ahu are found along the coast and face inland towards the community. There are some inland ahu such as Ahu Akivi. 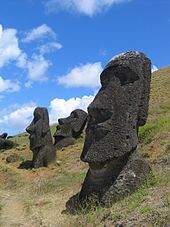 These moai face the community but given the small size of the island, also appear to face the coast. In 1979, Sergio Rapu Haoa and a team of archaeologists discovered that the hemispherical or deep elliptical eye sockets were designed to hold coral eyes with either black obsidian or red scoria pupils. The discovery was made by collecting and reassembling broken fragments of white coral that were found at the various sites. Subsequently, previously uncategorized finds in the Easter Island museum were re-examined and recategorized as eye fragments. It is thought that the moai with carved eye sockets were probably allocated to the ahu and ceremonial sites, suggesting that a selective Rapa Nui hierarchy was attributed to the moai design until its demise with the advent of the Birdman religion, Tangata Manu. Many archaeologists suggest that "[the] statues were thus symbols of authority and power, both religious and political. But they were not only symbols. To the people who erected and used them, they were actual repositories of sacred spirit. Carved stone and wooden objects in ancient Polynesian religions, when properly fashioned and ritually prepared, were believed to be charged by a magical spiritual essence called mana." Archaeologists believe that the statues were a representation of the ancient Polynesians' ancestors. The moai statues face away from the ocean and towards the villages as if to watch over the people. The exception is the seven Ahu Akivi which face out to sea to help travelers find the island. There is a legend that says there were seven men who waited for their king to arrive. The more recent moai had pukao on their heads, which represent the topknot of the chieftains. According to local tradition, the mana was preserved in the hair. The pukao were carved out of red scoria, a very light rock from a quarry at Puna Pau. Red itself is considered a sacred color in Polynesia. The added pukao suggest a further status to the moai. When first carved, the surface of the moai was polished smooth by rubbing with pumice. Unfortunately, the easily worked tuff from which most moai were carved is also easily eroded, and, today, the best place to see the surface detail is on the few moai carved from basalt or in photographs and other archaeological records of moai surfaces protected by burials. Those moai that are less eroded typically have designs carved on their backs and posteriors. The Routledge expedition of 1914 established a cultural link between these designs and the island's traditional tattooing, which had been repressed by missionaries a half-century earlier. Until modern DNA analysis of the islanders and their ancestors, this was key scientific evidence that the moai had been carved by the Rapa Nui and not by a separate group from South America. At least some of the moai were painted; Hoa Hakananai'a was decorated with maroon and white paint until 1868, when it was removed from the island. It is now housed in the British Museum, London, but there are demands (2018) for its return to Rapa Nui. The statues were carved by the Polynesian colonizers of the island, mostly between circa 1250 A.D. and 1500 A.D. In addition to representing deceased ancestors, the moai, once they were erected on ahu, may also have been regarded as the embodiment of powerful living or former chiefs and important lineage status symbols. Each moai presented a status: "The larger the statue placed upon an ahu, the more mana the chief who commissioned it had." The competition for grandest statue was ever prevalent in the culture of the Easter Islanders. The proof stems from the varying sizes of moai. Some statues were rock carvings and never intended to be completed. Some were incomplete because, when inclusions were encountered, the carvers would abandon a partial statue and start a new one (tuff is a soft rock with occasional lumps of much harder rock included in it). Some completed statues at Rano Raraku were placed there permanently and not parked temporarily awaiting removal. Some were indeed incomplete when the statue-building era came to an end. It is not known exactly which group in the communities were responsible for carving statues. Oral traditions suggest that the moai were carved either by a distinguished class of professional carvers who were comparable in status to high-ranking members of other Polynesian craft guilds, or, alternatively, by members of each clan. The oral histories show that the Rano Raraku quarry was subdivided into different territories for each clan. Since the island was largely treeless by the time the Europeans first visited, the movement of the statues was a mystery for a long time; pollen analysis has now established that the island was almost totally forested until 1200 A.D. The tree pollen disappeared from the record by 1650. Oral histories recount how various people used divine power to command the statues to walk. The earliest accounts say a king named Tuu Ku Ihu moved them with the help of the god Makemake, while later stories tell of a woman who lived alone on the mountain ordering them about at her will. Scholars currently support the theory that the main method was that the moai were "walked" upright (some assume by a rocking process), as laying it prone on a sledge (the method used by the Easter Islanders to move stone in the 1860s) would have required an estimated 1500 people to move the largest moai that had been successfully erected. In 1998, Jo Anne Van Tilburg suggested fewer than half that number could do it by placing the sledge on lubricated rollers. In 1999, she supervised an experiment to move a nine-tonne moai. They attempted to load a replica on a sledge built in the shape of an A frame that was placed on rollers. A total of 60 people pulled on several ropes in two attempts to tow the moai. The first attempt failed when the rollers jammed up. The second attempt succeeded when they embedded tracks in the ground. This was on flat ground and used eucalyptus wood rather than the native palm trees. In 1986, Pavel Pavel, Thor Heyerdahl and the Kon Tiki Museum experimented with a five-tonne moai and a nine-tonne moai. With a rope around the head of the statue and another around the base, using eight workers for the smaller statue and 16 for the larger, they "walked" the moai forward by swiveling and rocking it from side to side; however, the experiment was ended early due to damage to the statue bases from chipping. Despite the early end to the experiment, Thor Heyerdahl estimated that this method for a 20-tonne statue over Easter Island terrain would allow 320 feet (100 m) per day. Other scholars concluded that it was probably not the way the moai were moved due to the reported damage to the base caused by the "shuffling" motion. Around the same time, archaeologist Charles Love experimented with a 10-tonne replica. His first experiment found rocking the statue to walk it was too unstable over more than a few hundred yards. He then found that placing the statue upright on two sled runners atop log rollers, 25 men were able to move the statue 150 feet (46 m) in two minutes. In 2003, further research indicated this method could explain supposedly regularly spaced post holes (his research on this claim has not yet been published) where the statues were moved over rough ground. He suggested the holes contained upright posts on either side of the path so that as the statue passed between them, they were used as cantilevers for poles to help push the statue up a slope without the requirement of extra people pulling on the ropes and similarly to slow it on the downward slope. The poles could also act as a brake when needed. Based on detailed studies of the statues found along prehistoric roads, archaeologists Terry Hunt and Carl Lipo have shown that the pattern of breakage, form and position of statues is consistent with an "upright" hypothesis for transportation. Hunt and Lipo argue that when the statues were carved at a quarry, the sculptors left their bases wide and curved along the front edge. They showed that statues along the road have a center of mass that causes the statue to lean forward. As the statue tilts forward, it rocks sideways along its curved front edge and takes a "step." Large flakes are seen broken off of the sides of the bases. They argue that once the statue was "walked" down the road and installed in the landscape, the wide and curved base was carved down. All of this evidence points to an upright transportation practice. Recent experimental recreations have proven that it is fully possible that the moai were literally walked from their quarries to their final positions by ingenious use of ropes. Teams of workers would have worked to rock the moai back and forth, creating the walking motion and holding the moai upright. If correct, it can be inferred that the fallen road moai were the result of the teams of balancers being unable to keep the statue upright, and it was presumably not possible to lift the statues again once knocked over. However, the debate continues. Originally, Easter Islanders had a paramount chief or single leader. Through the years the power levels veered from sole chiefs to a warrior class, known as "matatoa". The therianthropic figure of a half bird and half man was the symbol of the matatoa; the distinct character connected the sacred site of Orongo. The new cult prompted battles of tribes over worship of ancestry. Creating the moai was one way the islanders would honor their ancestors; during the height of the birdman cult there is evidence which suggests that the construction of moai stopped. "One of the most fascinating sights at Orongo are the hundreds of petroglyphs carved with birdman and Makemake images. Carved into solid basalt, they have resisted ages of harsh weather. It has been suggested that the images represent birdman competition winners. Over 480 birdman petroglyphs have been found on the island, mostly around Orongo." Orongo, the site of the cult's festivities, was a dangerous landscape which consisted of a "narrow ridge between a 1,000-foot (300 m) drop into the ocean on one side and a deep crater on the other". 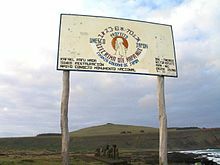 Considered the sacred spot of Orongo, Mata Ngarau was the location where birdman priests prayed and chanted for a successful egg hunt. "The purpose of the birdman contest was to obtain the first egg of the season from the offshore islet Motu Nui. Contestants descended the sheer cliffs of Orongo and swam to Motu Nui where they awaited the coming of the birds. Having procured an egg, the contestant swam back and presented it to his sponsor, who then was declared birdman for that year, an important status position." These figures are much smaller than the better-known stone moai. They are made of wood and have a small, slender aspect, giving them a sad appearance. These figures are believed to have been made after the civilization on Rapa Nui began to collapse, which is why they seem to have a more emaciated appearance to them. At some point after the 1722 Roggeveen visit, all of the moai that had been erected on ahus were toppled, with the last standing statues reported in 1838 by Abel Aubert Dupetit Thouars, and no upright statues by 1868, apart from the partially buried ones on the outer slopes of Rano Raraku. Oral histories include one account of a clan pushing down a single moai in the night but others refer to the "earth shaking" and other indications that at least some of them fell down through earthquakes. Some of the moai toppled forward such that their faces were hidden and often fell in such a way that their necks broke; others fell off of the back of their platforms. Today, about 50 moai have been re-erected on their ahus or at museums elsewhere. Eleven or more moai have been removed from the island and transported to locations around the world, including six out of the thirteen moai that were carved from basalt. It is forbidden for visitors to climb on the moai. From 1955 through 1978, an American archaeologist, William Mulloy, undertook extensive investigation of the production, transportation and erection of Easter Island's monumental statuary. Mulloy's Rapa Nui projects include the investigation of the Akivi-Vaiteka Complex and the physical restoration of Ahu Akivi (1960); the investigation and restoration of Ahu Ko Te Riku and Ahu Vai Uri and the Tahai Ceremonial Complex (1970); the investigation and restoration of two ahu at Hanga Kio'e (1972); the investigation and restoration of the ceremonial village at Orongo (1974) and numerous other archaeological surveys throughout the island. The Rapa Nui National Park and the moai are included in the 1972 UN convention concerning the protection of the world's cultural and natural heritage and consequently on the 1994 list of UNESCO World Heritage sites. The moai have been mapped by a number of groups over the years including efforts by Father Sebastian Englert and Chilean researchers. The EISP (Easter Island Statue Project) conducted research and documentation on many of the moai on Rapa Nui and the artifacts held in museums overseas. The purpose of the project is to understand the figures' original use, context, and meaning, with the results being provided to the Rapa Nui families and the island's public agencies that are responsible for conservation and preservation of the moai. Other studies include work by Britton Shepardson and Terry L. Hunt and Carl P. Lipo. 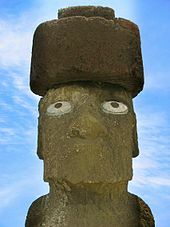 In 2008, a Finnish tourist chipped a piece off the ear of one moai. The tourist was fined $17,000 in damages and was banned from the island for three years. Tukuturi at Rano Raraku is the only kneeling moai and one of the few made of red scoria. Early European drawing of moai, in the lower half of a 1770 Spanish map of Easter Island; the original manuscript maps of the Spanish expedition are in Naval Museum of Madrid and in The Jack Daulton Collection, USA. This article contains Unicode emoticons/emojis. Without proper rendering support, you may see question marks, boxes, or other symbols instead of the intended characters. The official unicode name for the emoji is spelled "Moyai". This is the name of a statue near Shibuya Station in Tokyo, which is inspired by Moai from the Easter Island but looks distinct. This has caused inconsistent drawings to be adopted for this emoji by various companies with proprietary emoji images. This emoji has been used for comedic purposes and internet memes. Marae – The Polynesian ceremonial sites from which the moai and ahu traditions evolved. ^ Van Tilburg, Jo Anne. "Easter Island Statue Project". Eisp.org. Retrieved 10 March 2014. ^ a b c Hunt, Terry; Lipo, Carl (2012). The Statues That Walked: Unraveling the Mystery of Easter Island. Free Press. ISBN 978-1-4391-5031-3. ^ "Easter Island Statue Project". Retrieved 9 January 2019. ^ UNESCO World Heritage Centre (29 May 2009). "Rapa Nui National Park". Whc.unesco.org. Retrieved 10 March 2014. ^ Young, Emma (26 July 2006). "Easter Island: A monumental collapse?, pp. 30–34". Newscientist.com. Retrieved 10 March 2014. ^ "NOVA Online | Secrets of Easter Island | Stone Giants". Pbs.org. Retrieved 9 June 2013. ^ "What are Moai?". Thinkquest (discontinued). Archived from the original on 25 July 2013. Retrieved 6 October 2018. ^ Van Tilburg, Jo Anne (1994). Easter Island: Archaeology, Ecology and Culture. Washington, DC: Smithsonian Institution Press. p. 24. ^ Ford, Nick (15 December 2013). "Views on the origin and purpose of the Easter Island statues". Archived from the original on 30 June 2014. ^ "Mystery of the Easter Island Statues." Red Ice Creations. N.p., 27 Oct. 2011. Web. 30 Oct. 2013. ^ a b c "The Rise & Fall of Easter Island's Culture. Sentinels in Stone". Bradshaw Foundation. 2011. ^ The human figures would be outlined in the rock wall first, then chipped away until only the image was left. ^ a b Bloch, Hannah (July 2012). "Easter Island: The riddle of the moving statues". National Geographic. National Geographic Society. 222 (1): 30–49. Retrieved 3 June 2013. ^ Bernstein, Josh. "Digging For the Truth: Giants of Easter Island". Archived from the original on 31 October 2013. Retrieved 29 October 2013. ^ Flenley, John (2003). The Enigmas of Easter Island: Island on the Edge. Oxford University Press. ISBN 978-0-19-280340-5. ^ "Terry Hunt, Carl Lipo: The Statues Walked -- What Really Happened on Easter Island - the Long Now". ^ Mystery of Easter Island (TV Documentary). NOVA and National Geographic Television. Retrieved 10 November 2012. ^ Ghose, Tia (7 June 2013). "Easter Island's 'Walking' Stone Heads Stir Debate". LiveScience. ^ a b c "Mysterious Places: Explore Sacred Sites and Ancient Civilizations." Mysterious Places: Explore Sacred Sites and Ancient Civilizations. N.p., n.d. Web. 29 Oct. 2013. ^ "Easter Island - Moai Statues and Rock Art of Rapa Nui." The Birdman Motif of Easter Island. N.p., n.d. Web. 29 Oct. 2013. ^ F. Forment; D. Huyge; H. Valladas. "AMS 14C age determinations of Rapanui (Easter Island) wood sculpture: moai kavakava ET 48.63 from Brussels". Retrieved 29 October 2013. ^ J. Linton Palmer (1870). "A visit to Easter Island, or Rapa Nui, in 1868". Journal of the Royal Geographic Society. 40: 167–181. doi:10.2307/1798641. JSTOR 1798641. ^ a b Edmundo Edwards; Raul Marchetti; Leopoldo Dominichetti; Oscar Gonzales-Ferran (1996). "When the Earth Trembled, the Statues Fell". Rapa Nui Journal. 10 (1). pp. 1–15. ^ Terry L. Hunt & Carl P. Lipo (2011). The Statues That Walked:Unraveling the Mystery of Easter Island. Free Press. ^ Britton Shepardson (2010). "Moai Database - Rapa Nui". ^ Carl Lipo & Terry Hunt (2011). "Rapa Nui Database". Archived from the original on 11 May 2012. Retrieved 17 April 2012. ^ "Easter Island fines ear chipper". BBC News. 9 April 2008. Retrieved 21 September 2008. ^ "Tourist chips earlobe off ancient statue on Easter Island". Globe and Mail. 9 April 2008. Archived from the original on 13 April 2008. Retrieved 21 September 2008. Wikimedia Commons has media related to Moai.